Most of us have some sort of extended family. Although we may not get to spend much time with them, we know they will always step up to the plate when we are in need. My husband and I have quite a list that we consider our extended family. Whole communities have shown their support during our need over the last three years. Sharing this story of our local fair family and how they pulled together to show their support for us still gets me all choked up. Fair time is just around the corner and speaking of this instance just last week, filled my chest with overflowing gratitude towards the amount of people in our community that can rally, when one of it's members is down. already completed, I believe, five surgeries on my pelvis and bilateral ankles. Just a couple of weeks prior I had learned to take my first steps using a walker and had progressed to using a walker with wheels! What was equally as exciting was that I put on a pair of shoes for the first time in six months! The ominous wheelchair was still in my life, but fair time was too rugged for that cheap seat to functional properly at the fair grounds. 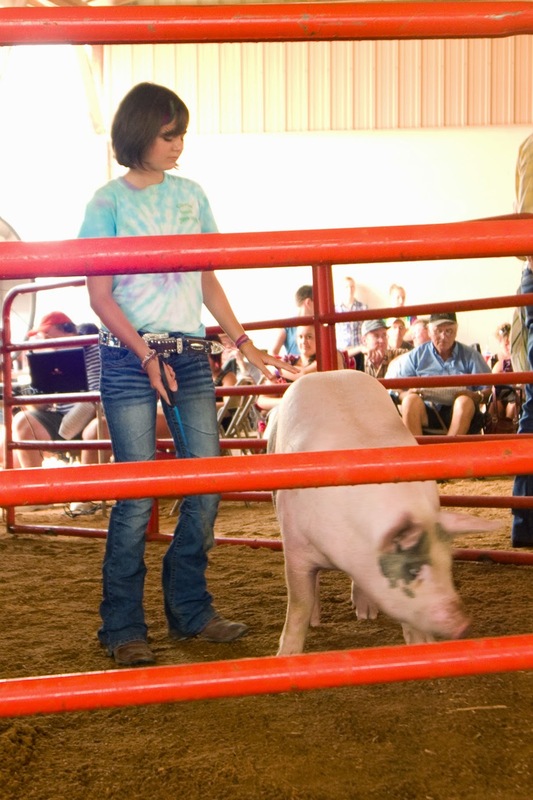 I refused to make our kids miss showing their livestock animals that year. I did not want my condition to continue to dictate the activities of my family. We could also use a "pick me up" by letting the kids have some fun and doing a little socializing ourselves. I could endure two trips to the swine barn a day or I could sit on my blue Yamaha, four-wheelin' walker and let the kids take turns pushing me. If I recollect correctly, it was only 117 degrees that July, which helped none with my already massively swollen ankles. All week our family received well wishes, hugs and sincere compassion from all who knew us. The moment that took the cake was Saturday's livestock sale. 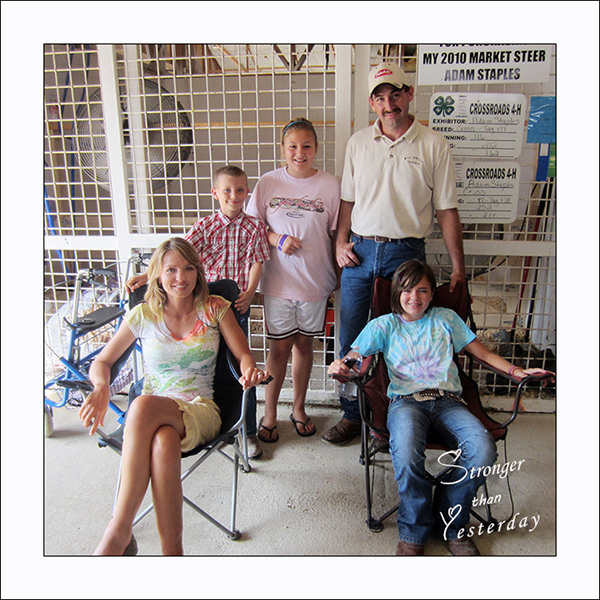 I sat next to the sale ring waiting for our kids to emerge one by one with their animals. Our middle two daughters won the top two awards in the swine division, it was our high light of the week! As our second oldest walked the ring with her pig, I had one camera in my left hand taking a video and another camera in my right hand snapping photos. I was being a "Mom" and loudly whispering for her to smile and look at the crowd when I finally heard the auctioneer say that she had set a record. What?! I was so busy juggling my cameras and insisting my daughter keep a smile on her face that I hadn't heard a single word the auctioneer had said. Both cameras stopped following my daughter as I turned my head to the right to view the crowd. I viewed a mass of people, but I didn't see a single face. My vision had tremendously blurred with the turning of my head as my mind wrapped around what these wonderful friends of ours had just done. My lips parted in awe as I swung my head to the left to find my husband leaning against a wall with his hands stuck deep in his pockets. His eyes were swimming with un-shed tears, that was my confirmation that I understood what was transpiring. I held his stare for so long that he walked over, knelt down beside me and wiped the tears from my cheeks ever so gently with his calloused knuckles. "Carey, these are good people," he said softly. Indeed you are, friends, indeed you are. $17 a pound that piece of pork brought on that hot, humid day. My daughter had no trouble keeping that smile from enveloping her entire face. To top it off, the hog was donated back to be auctioned off, this time to help with medical expenses! I made an inept attempt to focus on the rest of the sale, but it was a futile one. My emotions overwhelmed me as I sat in my lawn chair staring blankly, still in awe. Leaving the show pavilion, an acquaintance said in earnest, "Carey, the 2011 Crawford County Fair is the start to a better second half of this year." I believed that with all of my heart. Looking back, I'm not sure how I even attended that fair or survived through the pain that it cost me. Your can bet your bottom that I wouldn't have traded that moment for one pain free day. It was a turning point, a boost our family needed, but never would have asked for. That is what friends do best. We couldn't be more proud to be a part of a community like this. 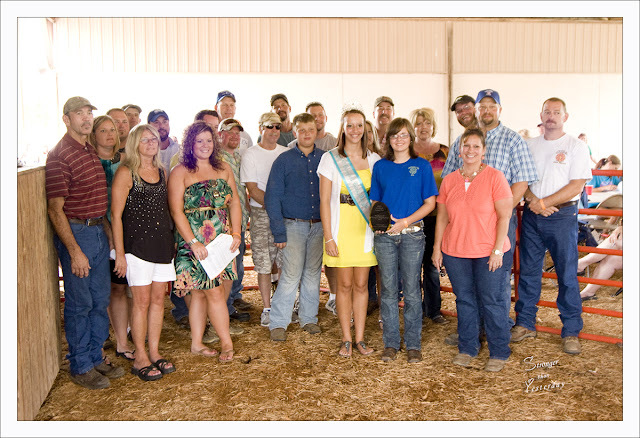 We love our Crawford County Fair Family!